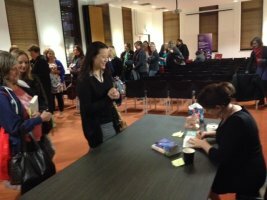 I was very excited when Julia Quinn was announced as the main guest for the RWA conference this year, until I realised that there was no way that I was going to be able to make it to Fremantle to see her. Thank goodness for ARRA who organised meet and greets in other cities so that other fans, like me, had a chance to meet her during her Australian trip. What came across from Julia Quinn during the conversation and following questions from the audience was just how personable she really is, and how she really knows who she is as a writer. Kate Cuthbert, an acknowledged Julia Quinn tragic, was the interviewer for the initial part of the conversation, which she started by talking about the acknowledgments in every book to Julia’s husband Paul. The fact that Paul is a bit behind on reading Julia’s backlist may have come up in conversation, or maybe it should be said that he is a lot behind having read only one of her books! Julia was then asked how she has liked visiting Australia and, of course, she said that she had loved everything so far, including Tim Tams. She has travelled around to a fair few places including the Daintree forest, climbing the Harbour Bridge and to Kangaroo Island (all things I have never done!). 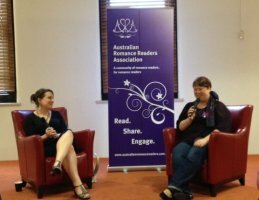 Turning more to the writing craft, Julia touched on the reasons why not many romances are making it into film. She believes it is because romance is so internalised, and also because it is usually written for women, by women, published by women whereas men tend to be the forces behind movies. She couldn’t name a favourite book that she has written. She went on to say that she has letters from readers saying that every single book is their favourite, a fact that she is justifiably proud of. She was asked if she would like to try writing anything else as in another genre, or even another type of romance, but Julia said that she doesn’t really have time. She still loves what she is doing now so she doesn’t really feel the need to change things up, not even with the current tendency towards darker historicals. She did say that occasionally she has writer’s malaise, where she needs to take a bit of a break, but she has never been totally blocked. At the end of the day she has bills to pay and a family to provide for so she needs to work. When asked for advice to aspiring writers, she conceded that she might not be the best person to ask as the publishing world has changed a lot since she was first published. Julia Quinn has been published with the same publisher since her first book, which is quite unusual now. Other advice was to grab time to write when you can. She writes in chunks or chapters, mostly chronologically, and she self-edits as she goes along, which means usually there is only one draft per book. The biggest piece of advice she gave … finish the book! Throughout the talk, other topics were how Lady Whistledown came into being, the shared author books with Eloisa James and Connie Brockway, music, how books get their titles and the way that women need to be perceived to be stronger in modern romances, which has to be balanced against the need to stay true to the times. She then moved onto talking about the role of social media. While Julia doesn’t like Twitter, she does like Facebook and the way that it has provided an interface that makes life easier for her in that she can be authentic and not superficial, but the interaction isn’t too time consuming. She couldn’t keep up with individual emails but she can now connect directly with readers all over the world including in other markets like Indonesia, the Philippines, Mexico etc. A show of hands in the room indicated that a large number of those present found out about the event from her Facebook page. There was quite a buzz in the room as everyone lined up to get their books signed, testament to how much everyone enjoyed the talk. Thanks again ARRA for giving us the chance to meet a fan favourite author! Our thanks to HarperCollins for their help in organising the event, and also to Mirna from Rendezvous Books for bringing along books to sell. Special thanks to Pamela Diaz for her help in organising and setting up and also for acting as host. Thanks also to Kate Cuthbert for interviewing Julia. Need to go back to our website? We are now taking bookings for 2019. Please contact us at arra.webmaster@gmail.com to request a spot. Enter your email address to follow ARRA's blog and receive notifications of new posts by email.